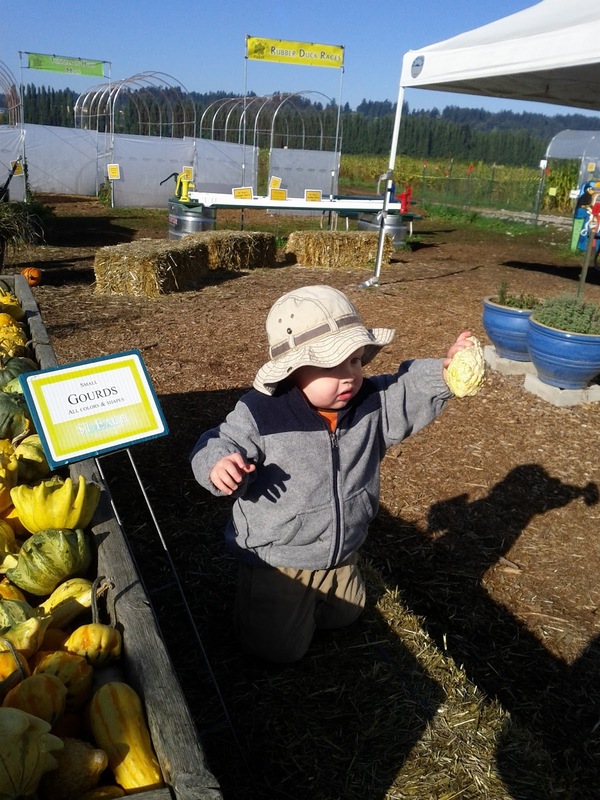 On Tuesday, one of the few sunny days since we moved here, our playgroup met at Dr. Maze's Pumpkin Patch for some festive fall fun. 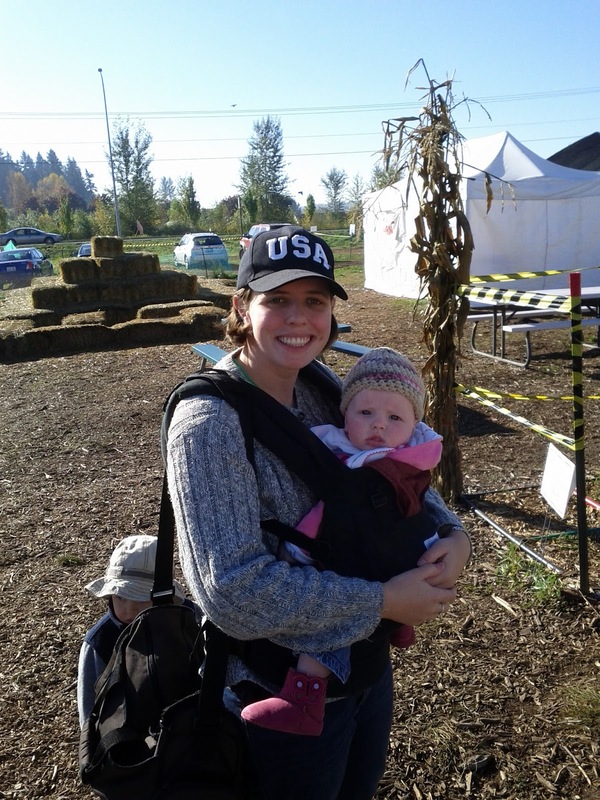 Jared, Eloise, and I had never been to a pumpkin patch before. Jared was really excited. 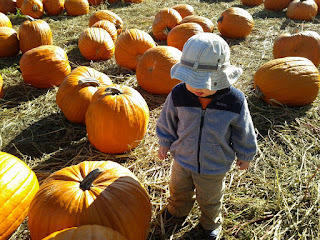 He got even more excited when we were waiting for our group to show up and he found displays of pumpkins and gourds of every conceivable shape and color. The table behind Jared in the picture below is set up for rubber ducky races. Jared had a great time priming the pumps, but then he got distracted before he ever actually raced a duck. 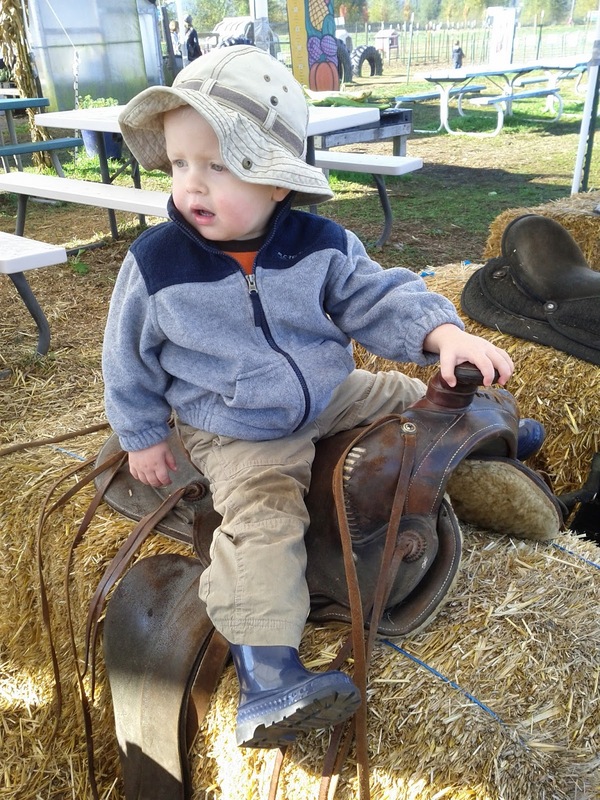 Jared is a born cowboy. He sat like that all by himself. 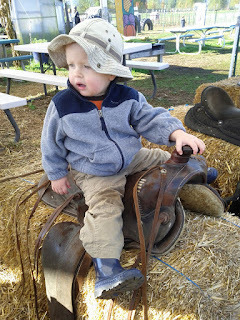 I only had to teach him to say, "Yeehaw!" and "Howdy!" 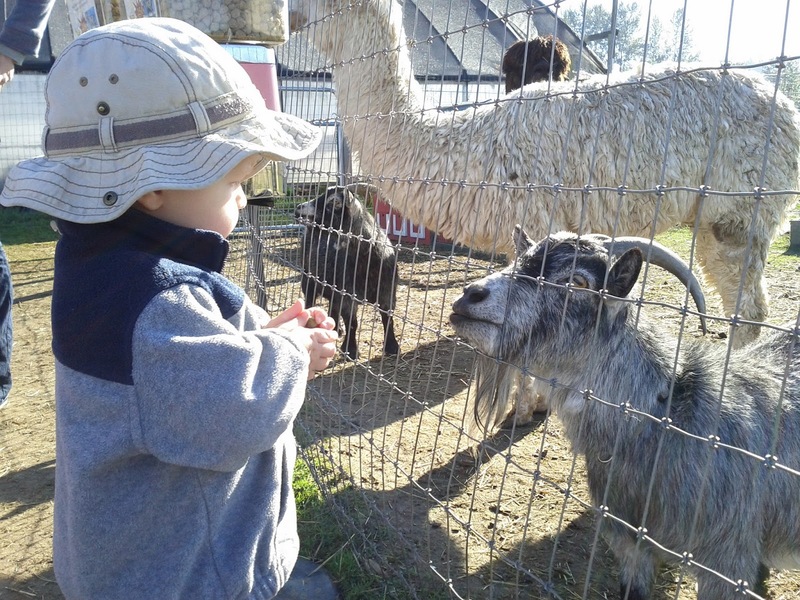 On Monday morning, Jared woke up and asked to go to a petting zoo. I didn't know where to find a petting zoo, so we settled for a quick trip to the pet store on Monday. 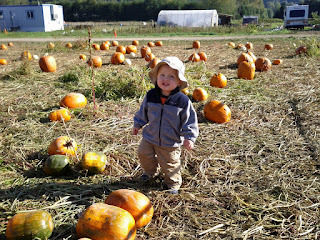 At the pumpkin patch Jared's wish came true. There was a pen full of chickens, ducks, alpacas, and African pygmy goats just waiting to befriend little boys and girls with fists full of food. Jared got to feed the animals out of his hands. He miraculously came away with all of his fingers. 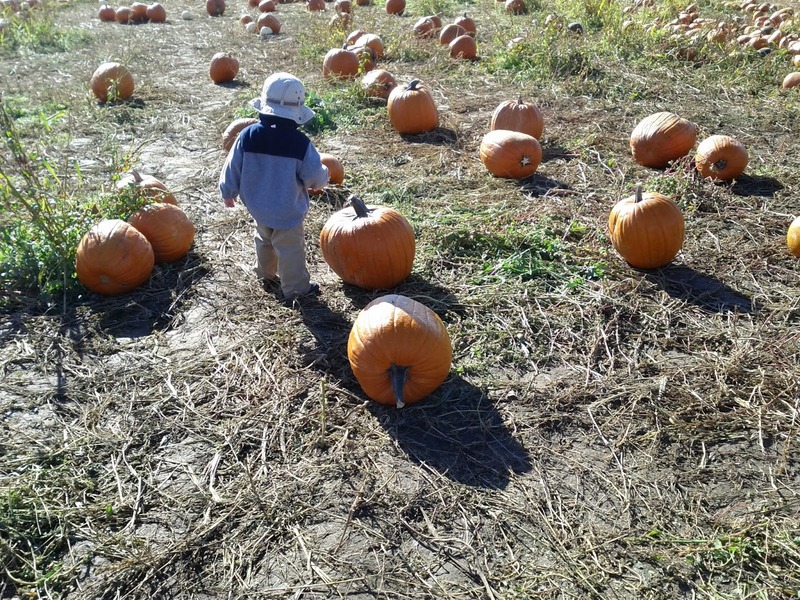 And there were pumpkins. 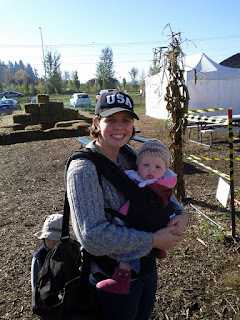 We didn't manage to get any pictures of our littlest pumpkin because after the excitement of the animals, a couple of potty runs, duck races, chatting with other mamas, and Jared touching every single variety of gourd on display, Eloise fell asleep. 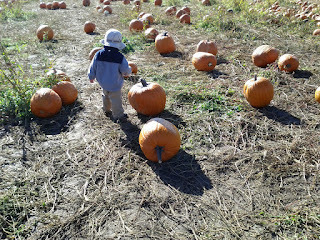 I told Jared he could have any pumpkin he could carry. 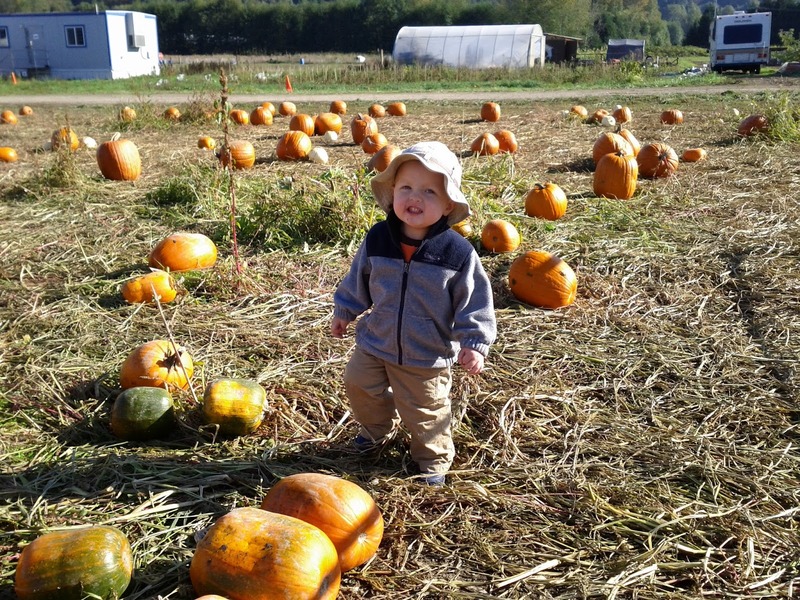 He started trying to pick up pumpkins. . . But the weeds were more portable. Then he found a rotten pumpkin to take apart, and he forgot all about getting his own pumpkin. Distracted. It's sort of a thing at this age. We ended up with a small pumpkin that I picked out to remind Jared of his experience at the pumpkin patch. 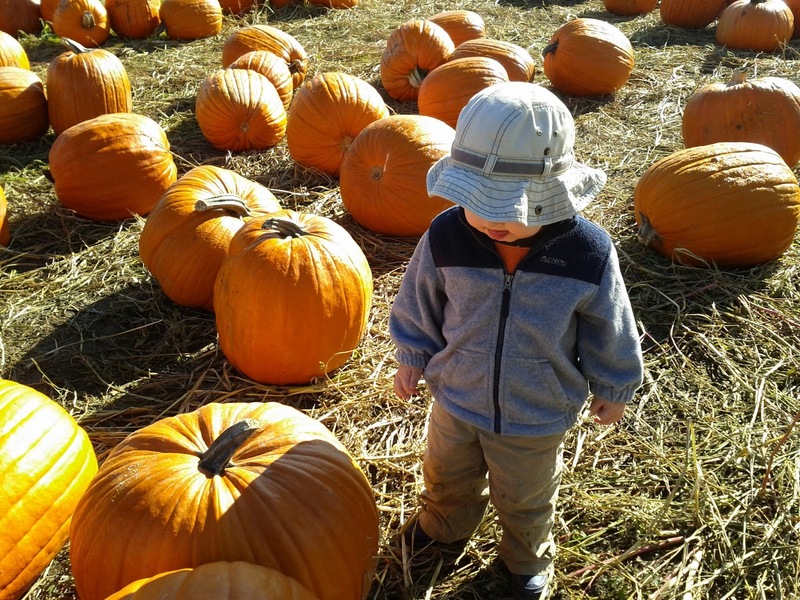 It was a beautiful day for an autumn experience. See you next spring, sunshine! Eloise is six months old! Where did the time go? The first half year of our princess's life has been very eventful. 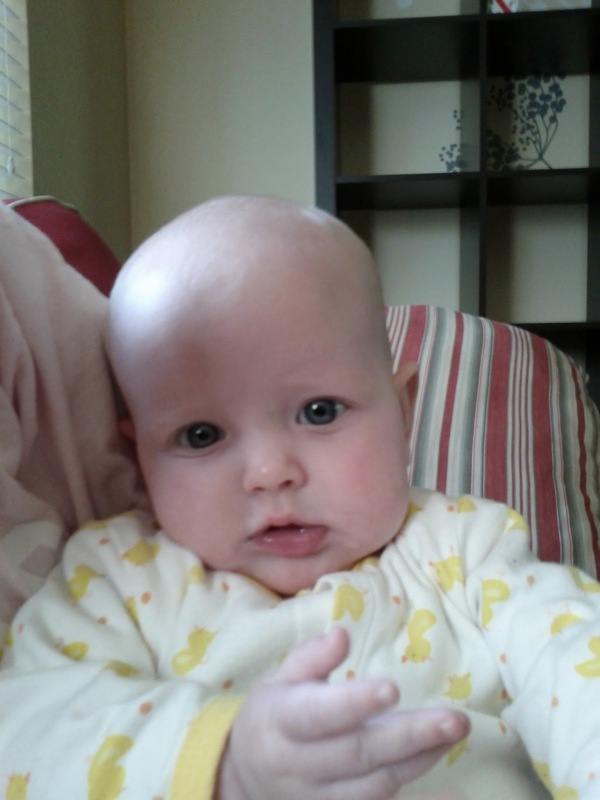 Eloise is a very alert, active baby. She loves to play on her tummy, where she can move around and see all of the action in a room. She tries to crawl, pushing with her legs, and pushing with her arms, so she moves one inch forward and two inches back. She can get around by rolling, but she gets very intent on her toys and doesn't like to leave them. Eloise drools constantly, and usually has something in her mouth. She isn't a big eater. She just likes to gnaw on the spoon. 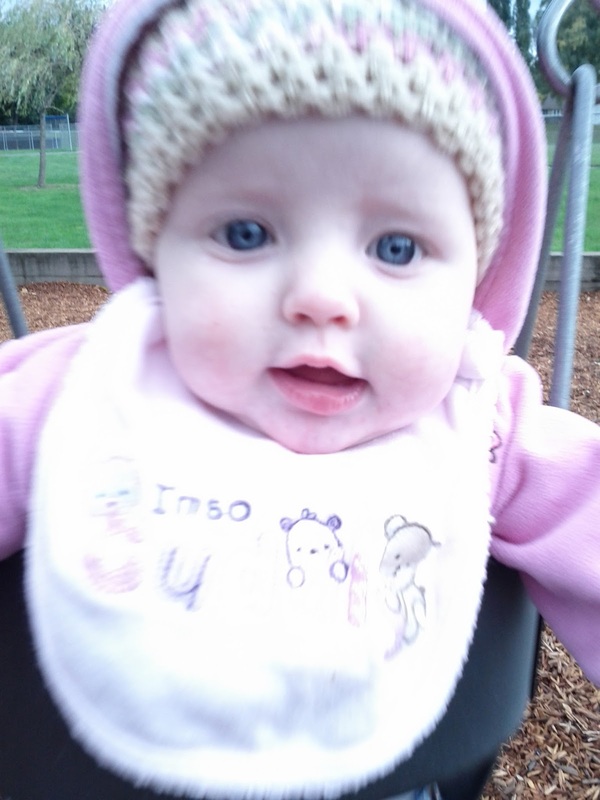 Eloise loves to be outside as long as she is bundled up. 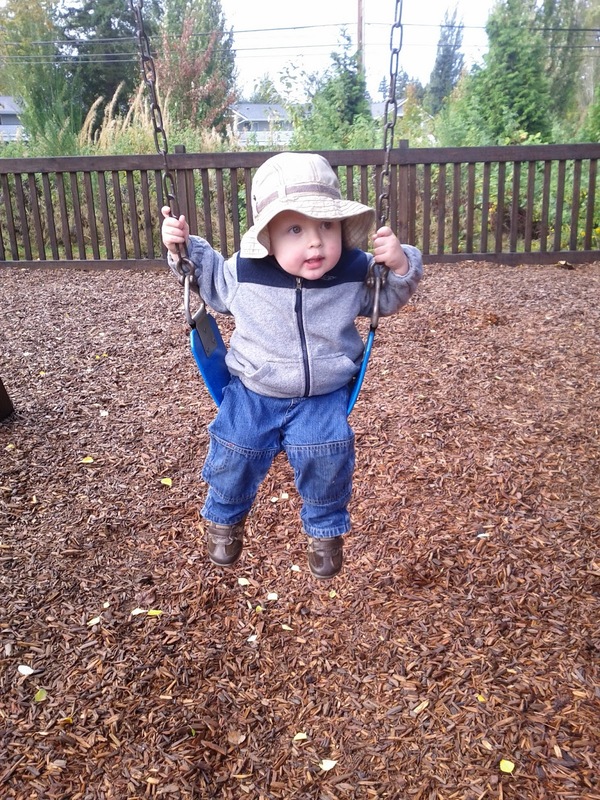 She LOVES swinging, especially when Jared is swinging nearby. The swing gives her a great vantage point to survey the playground. It can be pretty cold here. We are glad Aunt Cheyenne made this great hat. It is getting a lot of use on our bald baby. 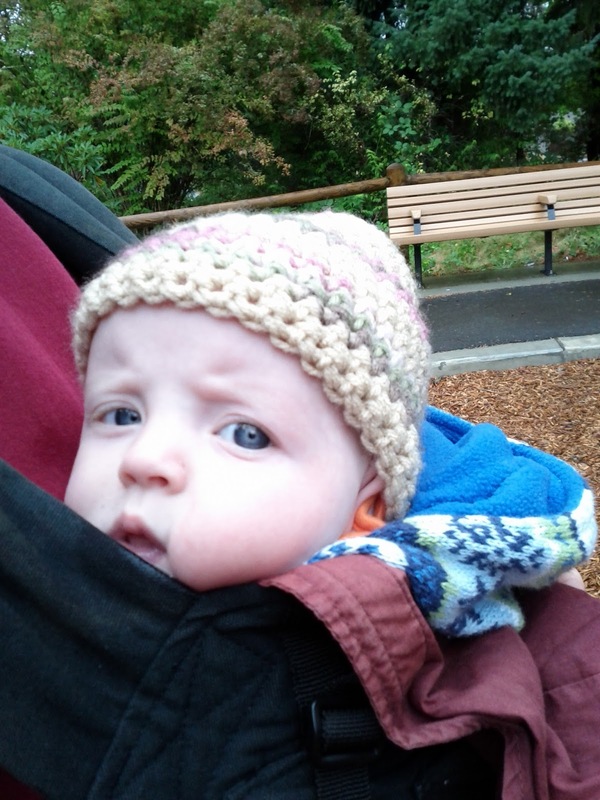 The Ergo carrier is Eloise's ride most of the time when we leave the house, and the only place where she can fall asleep when we are away from home. Eloise has found her voice and it is LOUD. She discourses noisily at inopportune moments. This is a habit that Jared has been happy to learn from her. To everyone at church who is wondering who was yelling, "Daddy! Daddy! Daddy! Daddy!" during the closing prayer last week. . . that wasn't Eloise. 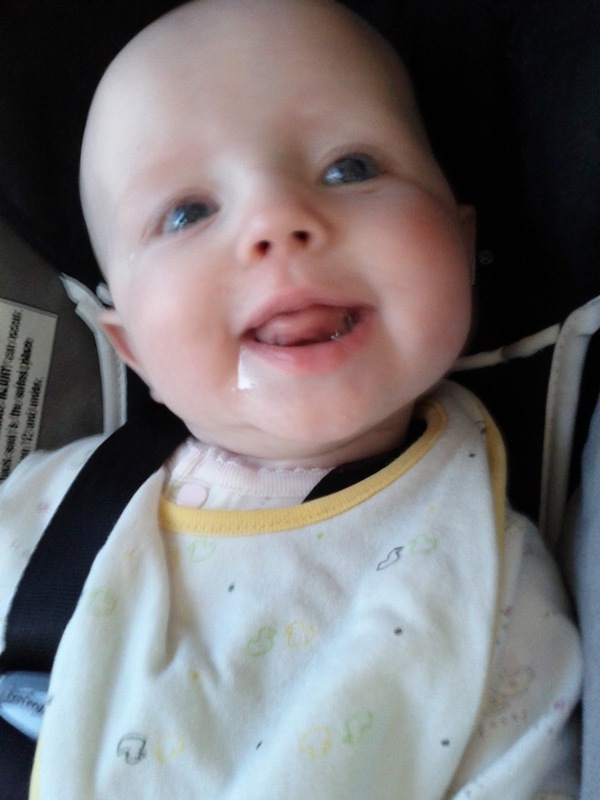 Eloise also has a silly voice, a cough for attention, and many variations on gurgling. Our favorite Eloise noise is the laugh. She laughs a lot, but never when we expect her to. 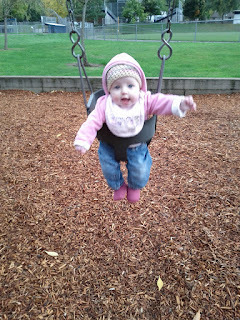 I mentioned that Eloise likes swinging and she likes toys. She also likes swinging her toys. She gets very excited about her toys and flails them around. She does not know her own strength, and doesn't always manage to hold onto the toy through the swing. I have only just managed to avoid getting a black eye from this enthusiasm so far. Eloise is no longer allowed to hold toys while she is eating. 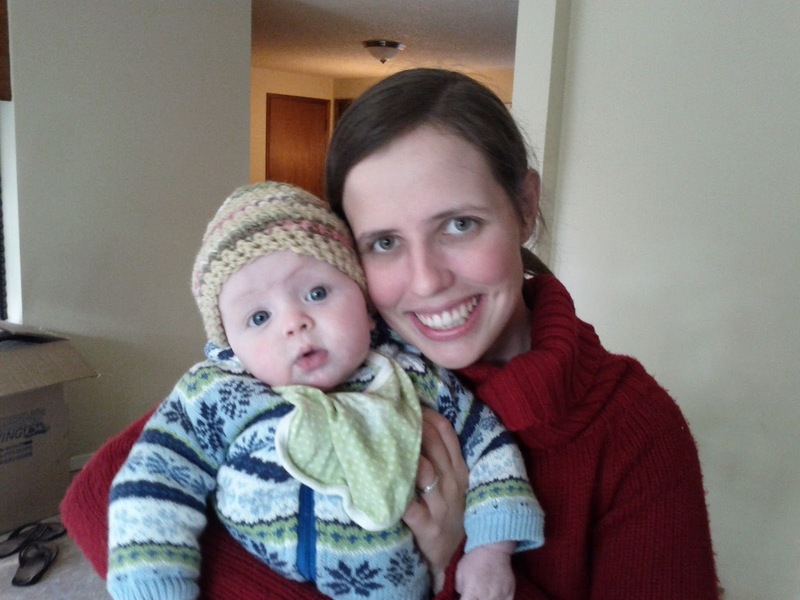 We don't have new measurements for Eloise, since we haven't found a new pediatrician yet, but stay tuned. We are so happy to see these beautiful blue eyes every day. I can't believe it's been six months already! Wow. A LOT has happened since I last posted. I will try to be concise. First, with some cleaning and truck loading help from good friends in California, we made it out of our old apartment. With a lot of help from Grandma Knight and Dan over the course of a very long day and a very very long night, we made the trip to our new home in Washington. The trip made a big impression on Jared. He still reminds us daily of Grandma letting him have ice cream. Dan seems to have assimilated himself into our family unit in Jared's mind, as he has said a lot of, "Please bless Mommy and Daddy and Dan," prayers. One of the features of our new home is a large yard. You know what that means. Yes. Two very happy children. On one of our first days here I took Jared outside to rake leaves while Eloise napped. 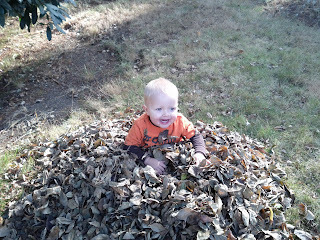 He was in leaf heaven. I raked leaves onto the pile he was sitting in as he laughed and laughed. "Mommy rake you!" 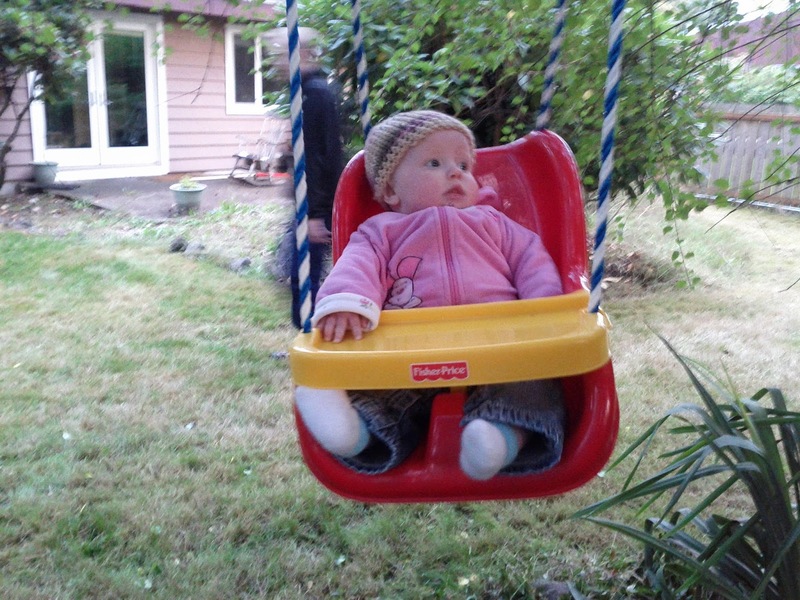 We got to hang up the swing (I optimistically bought in June) in our backyard! The wet weather and dozens of trees in our yard mean that our grass is never dry. Jared, who had one pair of shoes in California, needed some new boots. These are pretty much the cutest little rain boots ever. 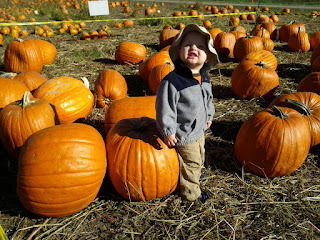 Not to mention the excessively handsome little blondie in them. 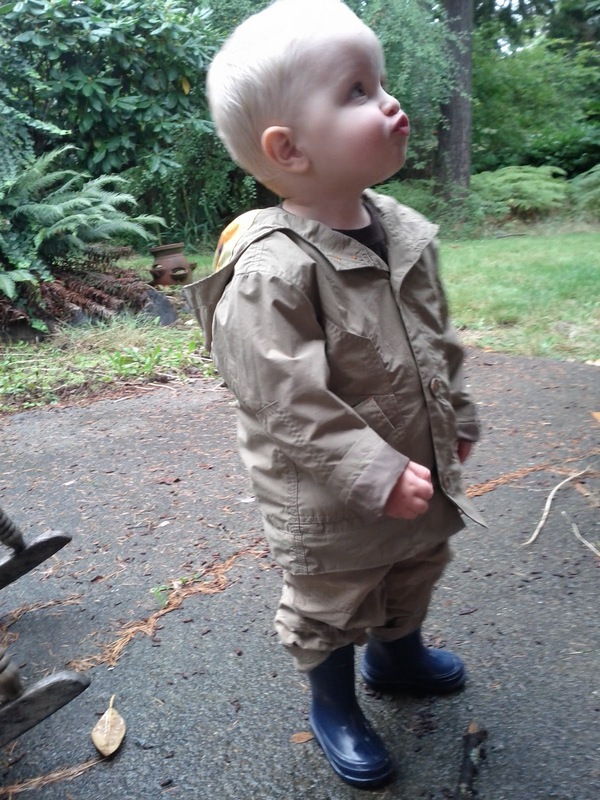 Jared wants to play outside all of the time. Whenever I tell him it is time to come in he says, "Jared stay outside all day." He asks for each of his meals to be turned into a picnic, even if it is pouring down rain outside. Of course we still go to parks several times a week. Jared and Eloise are both park enthusiasts. A little drizzling can't stop us from enjoying a lonely park. 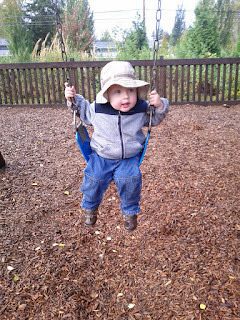 Jared now uses the big kid swing. What? I know. I can't believe it either. The reason he is soaking wet in this picture us because we got caught in a downpour between our car and the playground. Parking for this park (North Rose Hill Park) is not close to the playground, so we made a run for the shelter of the playground forts. We actually avoided getting too soaked in the rain, but then Jared decided to use his clothes as a towel to dry off the soaking wet playground. 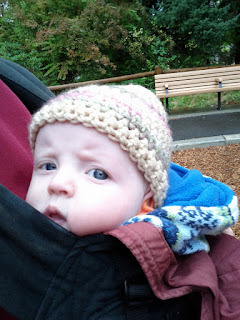 Even though the sun came out after about five minutes of rain, we didn't stay in the park very long that day. We have found a new story time at the Kirkland library, which Jared likes just as much as his old story time. We have a new playgroup with friends from church, and we are starting to feel like this is home. I think we will really know that this is home when Jared stops putting the "new" adjective on everything from the dishwasher to the garage. We did get Jared a new big kid bed, which has been an adventure. He didn't figure out that he could get out of it on his own for about a week after he started sleeping in it, but when he did the fun began. After a couple of days without naps and a couple of nights falling asleep in his dinner, we cracked down on staying in bed at naptime. Today's nap was relatively painless for everyone. Either naptime enforcement is working, or playing at the Bellevue Square Mall indoor playground this morning really wiped him out. 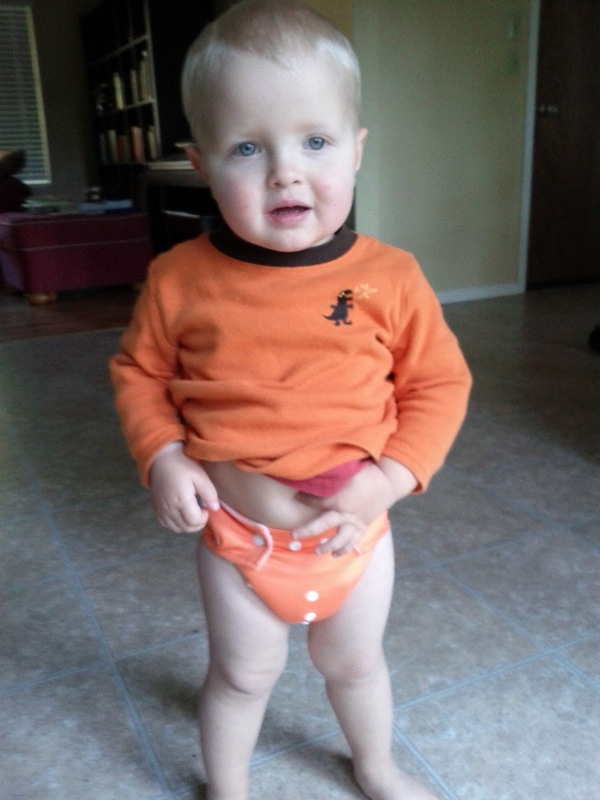 We also switched to cloth diapers, which I think are very cool. Here is Jared modeling one after a nap. Actually, he is showing off his belly button, but you can admire the cloth diaper, too. Todd may not be fully converted to cloth, yet, but I'm sure he will come around. On October 9, just a week shy of her half birthday, we introduced solid foods into Eloise's diet. We were hoping that they would help her sleep through the night, which she hasn't done in about three months, but so far we haven't succeeded. 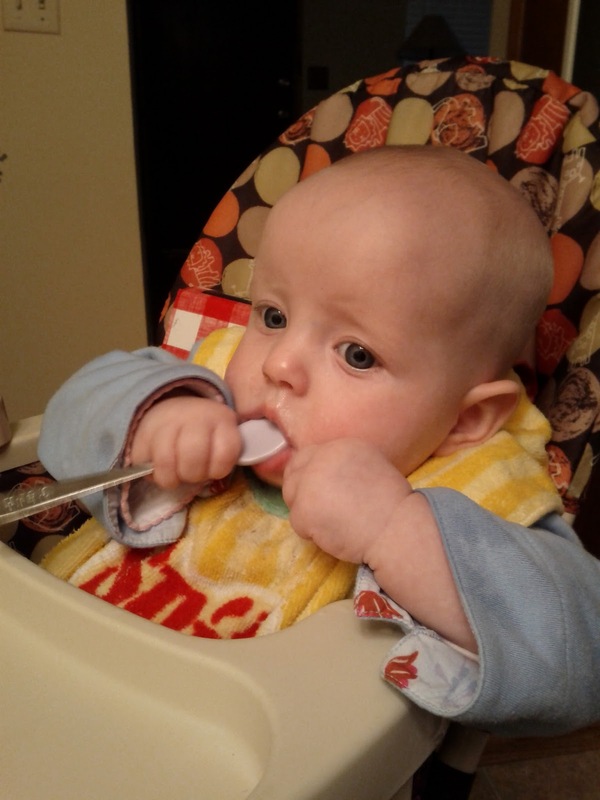 Here is the little show stopper's first bite of cereal. All in all, Washington is starting to feel like home. We miss our California friends, but we are busy busy busy, and starting to get excited for the holidays!